Located in a nondescript corner of the 3rd floor of Robinsons, The Heeren (btw, the new Robinsons at Heeren remind me of Selfridges in London...but that's a separate topic), that's only highlighted with this thin sign, the family and I went to Luke's Oyster Bar & Chop House for a special post-Christmas dinner. This particular branch at Heeren is very small and it has a bar seating as well as about 6 four-seaters and 4 two-seaters. 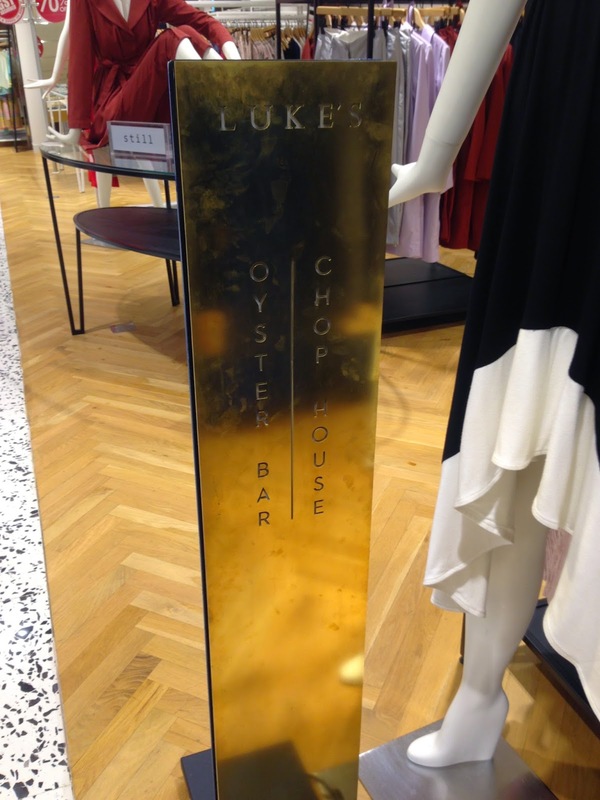 This means that in order to be assured of a table, please reserve in advance. The decor of this branch is a classy black and reminds me a little of the art-Deco era or a throwback to the 60's Hollywood glam. Love the signboard at the bar which is flanked by shelves filled with lots of whiskey/whisky bottles. As it's in a corner, the restaurant has 2 wall-to-ceiling windows that overlook Orchard Road. When making your reservation, do request to be seated near the window and then you can pretend that you're in Manhattan while dining. You'll impress your date immediately with the ambience. Instead of normal bread rolls, Luke's serves mini corn bread served with a dollop of homemade butter that's sprinkled with paprika. The corn bread reminds me of my brioche, where it was super crumbly but delicious. I'm not sure why but the butter tasted better than store bought ones. Perhaps it tasted a little...creamier? 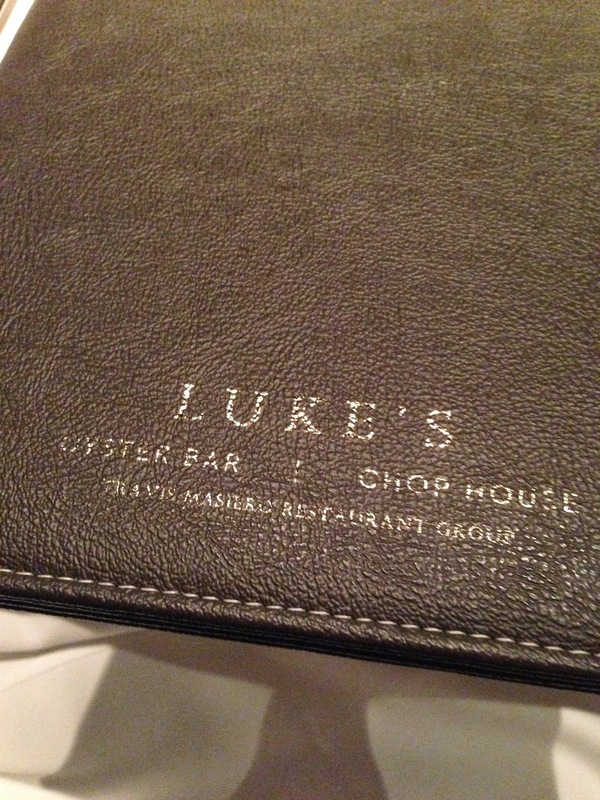 Since it's an oyster bar, we ordered half a dozen of assorted oysters (S$45++) and they are all from the 'specials'. We didn't get the Moonstone variety though. So these yummy morsels were flown all the way from the US and interestingly enough, each variety had very subtle differences. I only managed to try the Rome Point and Mantunuck oysters and the differences were that the Mantunuck oysters tasted a little more briny while the Rome Point oysters had a stronger after taste. All were freshly shucked and super delicious! I didn't try the champagne vinegar that came in the middle of the bowl. I like my oysters neat with maybe a squeeze of lemon. My family loves veg so we ordered a classic Caesar salad (S$26++) to share and you can have the option to add fried oysters for an additional S$3++ but we chose the one without. 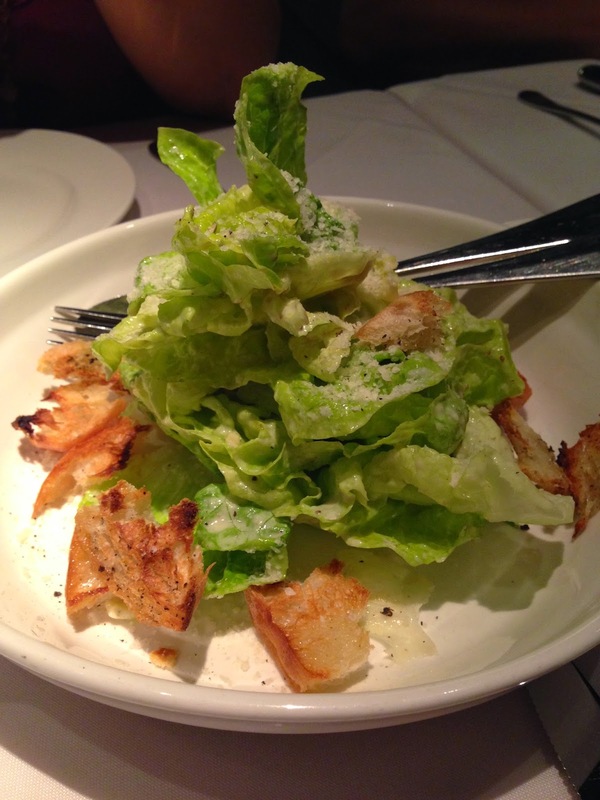 I liked that the dressing wasn't over powering the salad and that the croutons were slightly chewy rather than crunchy. The Parmesan was generously sprinkled on the salad too but again, surprisingly, this did not over power the whole plate. However, the best Caesar Salad that I've ever eaten still goes to Bridge Cafe. 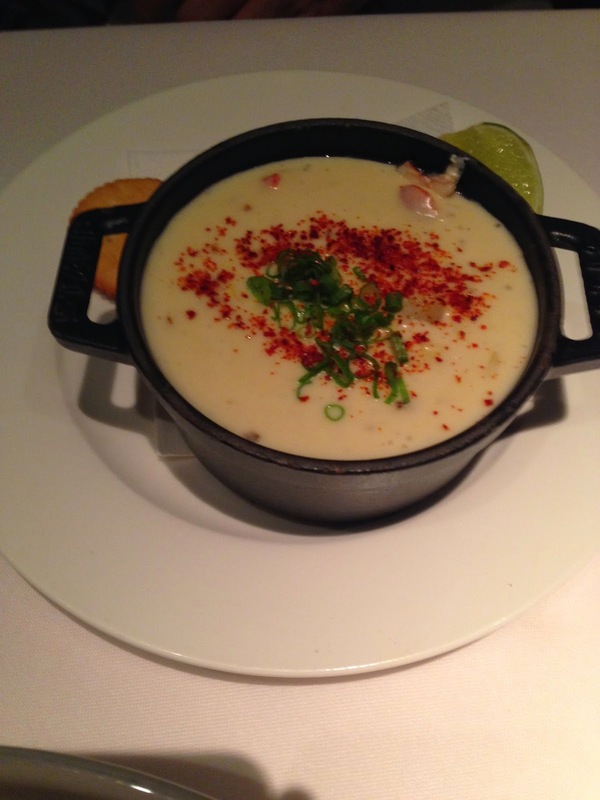 Dad had his own starter of Lobster & Corn Chowder (S$22++) which was thick enough for my brother to get a taste of it using a fork. It was very thick and tasty but you could tell that there was quite a bit of butter in there so if butter isn't your thing, this is not the soup for you. 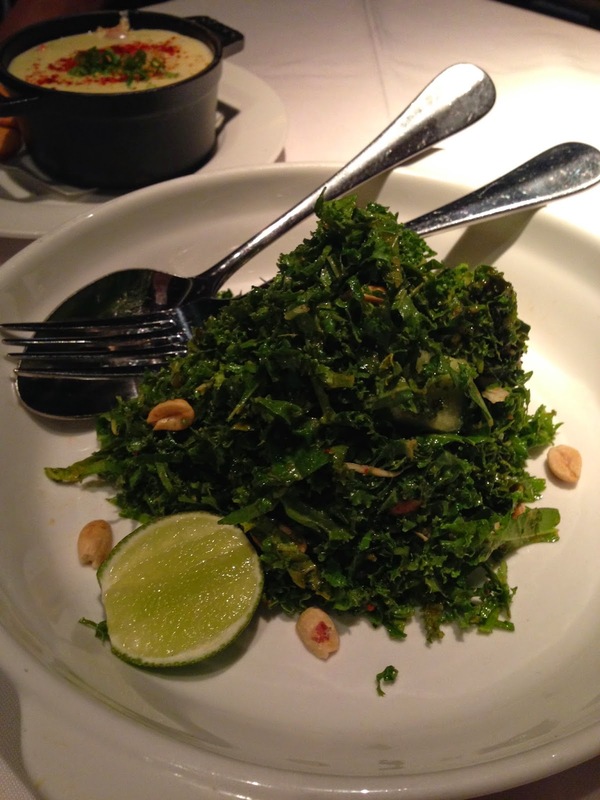 I ordered another salad - Kale Salad (S$26++) which came with peanuts and a peanut dressing. One mouthful of this and I declare this Kale with non-spicy satay sauce. Yup, that's how it tastes like to me. Not peanut butter but satay sauce. Minus the chilli. It's interesting and quite yummy and it tastes better with the squeeze of lime to cut back on the thick peanut dressing after a full mouthfuls. Then came our mains! Dad, bro and I ordered the Bone-in Tenderloin Au Poivre (S$74++) which is a 300g steak that's encrusted with crushed peppercorns and in a mustard cognac jus. The steak was perfectly cooked to your requested doneness and it was very tender. I also really liked the cognac jus as it complimented the steak perfectly. I wished there was less peppercorn though. I had to scrape away the whole lot because biting into the peppercorns caused my mouth to only taste pepper and not the beef nor the jus. The steak was also very lean, which is great for people who just want to load up on the protein and not have to worry about fats. This is really one of the best tenderloins that I've eaten in Singapore. I spied my little eye on the table next to ours and they ordered the Ribeye with confit garlic (S$88++) and it looked really dry. It was a 400g steak that came either 'Naked' or 'Luau' style but I just saw some glaze on the top of their steaks with a whole head of garlic that's sliced off at the top and fried/roasted. Hmm...I'll stick to my tenderloin that comes with jus. 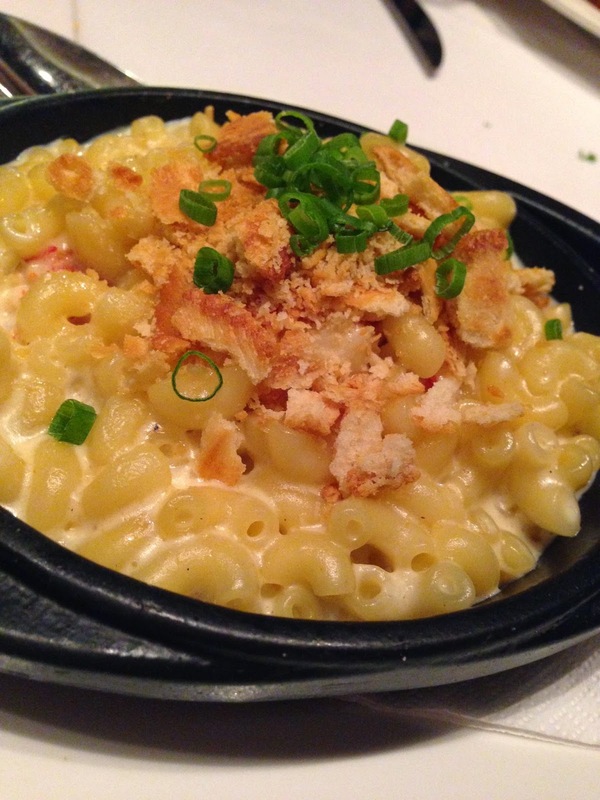 As a side to our mains, we ordered the Lobster Mac & Cheese (S$26++) and this was soooo good. Don't expect a layer of cheese at the top but do expect macaroni that's still al dente, swimming in a cheesy creamy sauce that has bits of lobster inside. Mum went for the Georges Bank Scallops as her mains (S$47++) and it was pan seared to perfection. You can't really go wrong with scallops unless you undercook/over cook these tasty medallions of seafood. Mum ordered the Coconut Cake (S$16++, if I remember correctly) and it's a massive slice so I suggest sharing this one. The cake itself was very moist and flavourful so those who love anything to do with coconut (like my mum) will adore this cake. The coconut shavings on the outside of the cake is not dessicated coconut but rather dried coconut flakes, adding to the coconut flavour subtly. The rest of us had a very adult version of cookies and milk. It's actually Warm Chocolate Chip Cookies with Stout Milkshake (S$16++). This picture is actually a 'split' version because I shared with my brother and the wait staff helped us to split it into 2 servings! So the usual one will have 2 chocolate cookies and 1 full glass of the Stout Milkshake. The warm cookie was full of chocolate chips and the gooey sweetness was contrasted nicely with the stout milkshake which was creamy but still retained that slight hops flavour from the stout. Thus, it was a nice balance between sweet and bitter but it was all good and super satisfying. Can they just sell the milkshake separately? In a larger glass? Please? For cocktails, my bro had previously tried their Rock & Rye (S$21++) which he said was very good and he was very intrigued with the square ice that was clear and bubble-free. It's details like this that make you feel that it's worth paying the prices on the menu, I guess. Yes, it's not the cheapest place in Singapore for a piece of good steak. However, the ambience is a lot nicer and less false compared to Lawry's. The view is a lot better than Morton's (what view?) thanks to the windows while the service staff were all super friendly. Thus, this is one of the ideal places to impress your date if you feel like splurging and the best part is that you'll walk away feeling that the money was well spent because of the whole package!